Q1. Are your artworks authentic and original as your commitment? 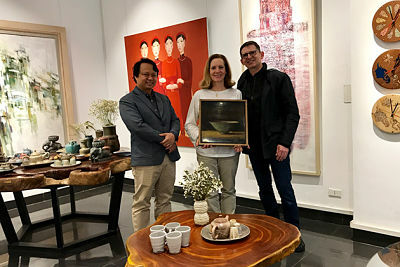 Yes, at Nguyen Art gallery we only sell original artworks from our established and emerging artists, all of the artworks are signed by the artists. Q2. How can we check if the artworks are original? Since we sell the artwork, we issued a Certificate of Authenticity signed by the artist and the Director of the Gallery. Therefore, you can be assured that the artwork that get is an original. We are guarantee for the Certificate that we issue and we take a responsibilities for that. Q3. Is original artwork from your gallery worth for a financial investment? As a gallery to promote artworks from many artists, we are also the art lovers and we invest in art our selves. We encourage you to buy art for their beauty and improving the aesthetic value of your homes and office spaces. However, art is also a financial investment and it very much depends on depending on the fame of the artist as well as that piece of artwork. For more information on Artwork as a financial investment visit some website that specialize in art auction would explains the same. Q4. Do you ship door to door internationally? Q5. How much does shipping cost? Shipping costs would depend on the weight or the measurement of the artworks (the artwork box) and the country of destination. The average price for canvas artwork shipped in tube is US$ 80 to Asia; US$ 140 to USA, Canada, Europe and US$ 150 to the rest. Please be advised that not every art work could be rolled up and put in tube. In some cases the surface of the artwork could be cracked if we roll it too hard. In many cases, we need to make a wooden box to ensure the artwork is well protected and you will receive it intact. In that case we will inform you the amount for shipping case by case We always charge our clients at the net cost of the ship price as the shipping company offer us. The package box or is offer free by the gallery. We also offer free frame. Q6. How long does it take to ship to us from your country? You will expect to receive the artwork within the time as below: - 1 to 2 days to ASEAN countries - 2 to 4 days to other Asian countries - 5 days to a week to USA, Canada, Europe and the rest. Q7. Who is your shipping partner? We work well and have a lot of to ship all over the world with: FedEx Express, DHL, TNT or UPS. Q8. What happened if the artwork is damaged during shipment? In the unexpected event happened like that, you should call us immediately at our telephone number +84 4 37476001 or hotline number of Mr Le Xuan Huong @ +84 913 342 887 or e-mail us at: [email protected] . The option for damaged work is change by an equal valued one or a full payment refund. Q9. Is your shipping insured? Since we ship with some professional shipping companies, they would compensate in case of artwork damage as their policies. Beside that we also buy the insurance from International Insurance Company (VIA) and transportation insurance incurs 2% of value of artworks and is charged separately. In case of loss or damage, insurance company will reimburse the full amount to the customer. Contact us if you want to buy transport insurance for your artwork. We accept all major credit cards such as Visa, MasterCard and PayPal. If you would rather, we also accept bank transfers. Q11. Will I be charged tax? In some cases, you will be charged tax on the artworks you buy. It depends on your country origin. We will assist you well for this when you decide to buy artworks from us. Some country like USA, you would not be charged Tax when you buy artworks. Q12. If I am not happy with the product can I return it? We apply 7-day return policy makes your purchase at www.nguyenartgallery.com completely risk free. If you are not satisfied with your purchase, you can return it to us and get a full refund (we will fortified cost of one-way shipping). You will need to pay one way shipping. Returns must be suitably insured. As soon as we receipt the artwork, we will proceed to refund the amount of money. Q14. Can I cancel my order? Q15.How can I check if the artwork I bought shipped? When we ship the artwork, we will send you the invoice with the sign and code from shipping company. You can use that code to check on the website of the shipping company to check where your item is.